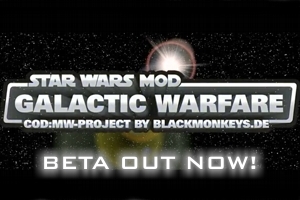 0.4 of Star Wars Mod: Galactic Warfare. fantastic gameplay of the COD4-Multiplayer. others in different locations as well as further weapons and player models are of course in the works. help also from other modders and members of the worldwide community. and all associated items are the intellectual property of Lucasfilm. ©2009 Lucasfilm Ltd. & ™ All rights reserved. information about us, you are always welcomed at www.blackmonkeys.de. already in the beta. Enjoy! May the force with you and merry Christmas! uDi is running the mod on our Chicago based server. Got a chance to run through it with a bunch of people last night and it was a lot of fun. Hope to see you there. what version of cod4 to run this? 1mbps redirect on the server, just dl it ingame @ 64.120.21.184:28960. I've had this error in BF2 a lot lately. I narrowed it down to the latest version of steams in game overlay. As soon as I disabled it in game, it was fine. If you have steam that is. Thats a typical problem with COD4. Its not because of the Mod. It came up within the last months. 188.40.94.214:28963 at Germany, Gametype TDM, Maps: Tatooine | KSToujane | Matmata | Highrise | Punkbuster On! Download via Server with 100mbit/s Redirect. I tried joining a server but after it came up 'awaiting challenge' it says 'Server is a different version: 1.7'. What is the 1.7 version? 64.120.21.184:28960 still is rockn it. waiting on new maps, chicago 100mbit. TDM,HQ,TDM,CTF is the cycle. ENJOY! Now all we need is the community to make maps for us! The non sw maps are retarded. 1:what do i do after i download it? 2:does it work on story mode? Hopefully it has more work to be done. Maybe some new maps soon? I have downloaded and played around with this a little and I have to say great job to the developers. I've not been able to find any servers running this mod in the in game browser, but I am able to connect to the servers listed above. The only downside I've seen is some of these servers make you download additional mod files for it like voices, etc. I don't want that crap that wasn't put out by these developers. Also, they don't just run the Tat sw map, they run normal cod 4 type maps. I think that's just plain stupid. I don't want to play on Backlot in the sw mod, lol. I know I can simply just find a server that has the type of gameplay I like but I felt that these things were too annoying to not post. Just my 2 cents. I can't wait for more SW maps.